My lovely cousin just sent me a wonderful cookbook the other day. 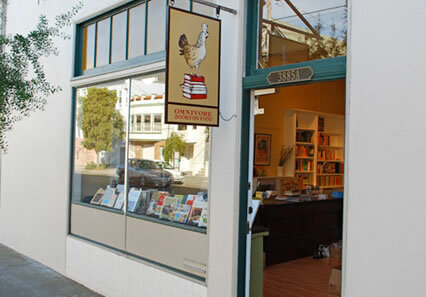 She happened upon this great bookstore called Omnivore which is located in San Francisco. They sell food-related books of all kinds: new, collectible and antiquarian. I cannot wait to check this place out! They appear to hold all kinds of interesting events, the most recent being on the weekly newsletter, “The Tablehopper’s Guide to Dining and Drinking in San Francisco: Find the Right Spot for Every Occasion,” by Marcia Gagliardi. Not only was this event free, they had Andrew Mariani of Scribe Vineyards pouring his wine. I just recently visited Scribe and I have just three words to say about it: GO THERE STAT. It was an amazing experience, but that will be shared in another post. Meanwhile, if anyone ventures out to Omnivore Books, let us know how you liked it! Bon Appetit article featuring Omnivore back in 2009. Recently I had been gifted with a pack of mini tartlet pans for Christmas. I instantly had visions of glistening, jewel-like, ripe fruits, plump vanilla beans and luscious french pastry cream. But my days were fairly busy, too busy for making pastry cream, although it’s my favorite dessert to make. 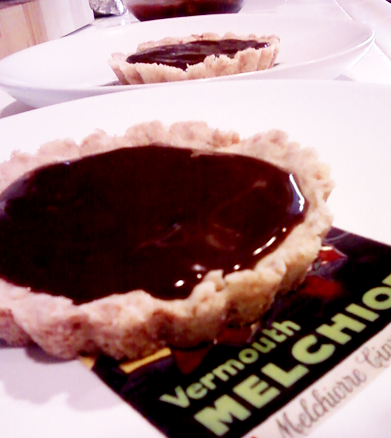 So in the end I decided to do a simple ganache tartlet. Let’s talk a bit about ganache. Ganache is made from chocolate and cream. Since there are so little ingredients used, you want to use the best quality of ingredients you can find/afford. It makes all the difference. The ration of cream and chocolate matters greatly since it is used from truffle making to glazing. If you want to use it as a glaze, you use about 3 times as much chocolate as cream. Since ganache is unbelievably rich, I wanted to add another layer of flavor to reign it in a bit, so I went with peppermint. I think it turned out to be pretty delicious, not to mention really easy! Try it out and let me know how it goes! Chop chocolate into small chunks and put into heatproof mixing bowl. Heat cream in a medium size pan until it begins to boil. Pour the cream over the chocolate and let it sit for 1 minute. Using a rubber spatula, scrap sides and gently stir until melted and smooth. Gently mix in peppermint and pour mixture into baked tartlet shell and chill for at least 1 hour.